External pressure (vacuum) calculations start off more complex than internal pressure calculations, and once jackets or other sources of pressure are added the difficulty increases. The external pressure rating depends upon more variables and the failure mechanism is more difficult to understand. This article is only an introduction, but it also covers many of the areas of external pressure that often need to be explained. Common mistakes made with external pressure calculations are listed. Sample vessel calculations are included throughout this article based on a vessel 48″ diameter x 96″ long with a Flanged and Dished (F&D) head at one end and a Semi Elliptical (SE) head at the other. As the design conditions change, the required shell thickness is updated. Internal pressures are calculated at 30 psi for comparison. 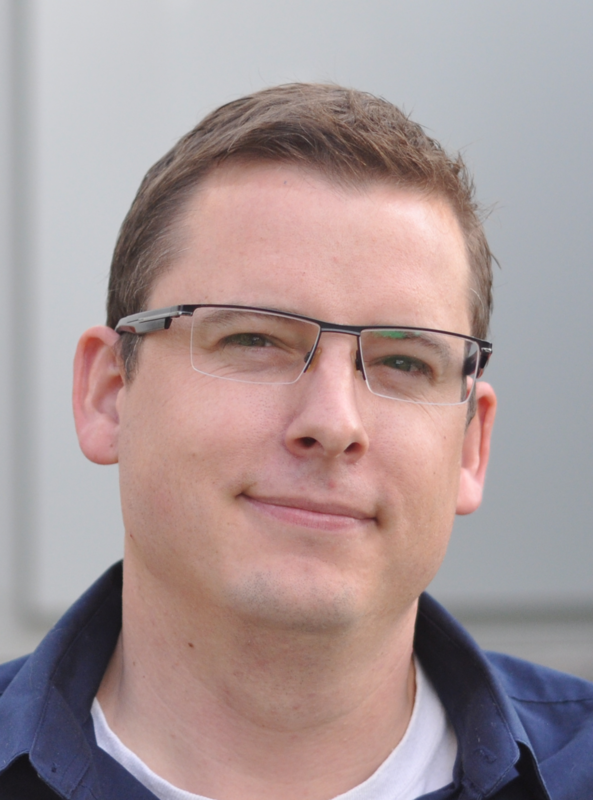 Download the sample calculations at the end of this article. The mechanism of external pressure failure is different from internal pressure failure. Different methods are required to design vessels to safely handle this different failure mechanism. Internal pressure failure can be understood as a vessel failing after stresses in part or a large portion exceeds the materials strength. In contrast, during external pressure failure the vessel can no longer support its shape and suddenly, irreversibly takes on a new lower volume shape. 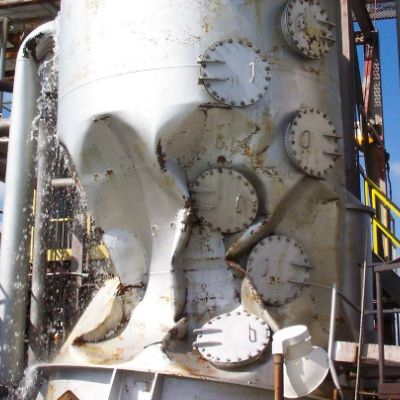 The following three pictures show vessels of reduced volume after external pressure failure. The fourth picture shows an internal pressure failure for contrast. A storage tank tested crushed after hydrotest when a plastic sheet blocked the top vent during draining. The volume of vessel decreases. Vacuum failure of a barometric condenser (vacuum vessel) after the internal support rings failed. The volume of the vessel decreases. A storage tank tested to destruction with an internal vacuum (external pressure). The volume of the vessel decreases. Unexpected INTERNAL pressure failure during hydrotest (caused by pressure stress and helped by unacceptable material properties) . Here volume increases until failure occurs. compare this with the external failure examples. From a combination of the first two – vacuum inside + pressure greater than atmospheric outside. Two simple and unexpected sources of vacuum – unloading a vessel or a tank that is not adequately vented – or – cooling down a vessel filled with steam that condenses to water. It is good practice to design any vessel exposed to steam service for full vacuum, the cool down rate can be very fast, overloading vacuum protection equipment. 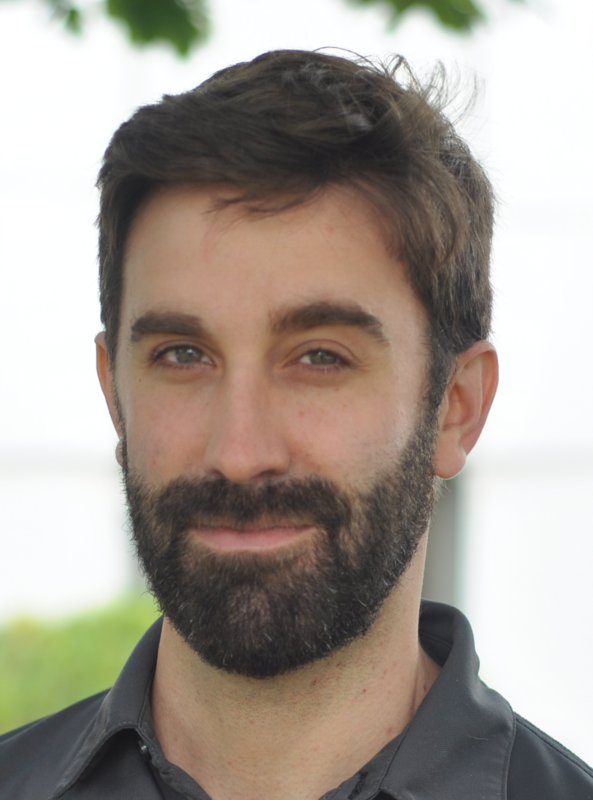 material properties – a lower yield point is less stable from plastic collapse and a lower modulus of elasticity is less stable from elastic collapse. Elastic and plastic collapse will not be discussed further here. Large vessels typically have lower external than internal pressure ratings. These four variables are used in Code equations which can specify the thickness of a safe straight shell. Similar methods are used to calculate heads. Nozzles are calculated using the familiar area replacement rules. In addition we can use burst (proof) testing or finite element analysis to calculate components not covered by the code rules. The code rules are on average very conservative, but greatly simplify what would otherwise be very difficult calculations – this has been a good trade off. 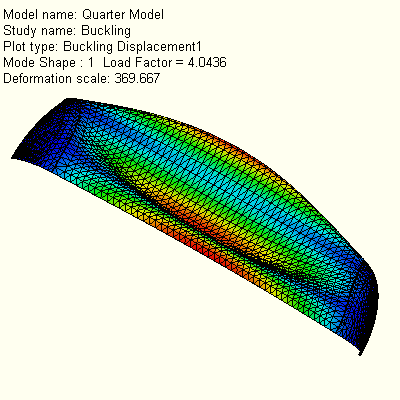 The finite element analysis and burst testing are done to a usually less conservative 3x factor of safety (See ASME VIII-1 UG-101(p)) where exact testing or analysis information replaces generalized code rules. 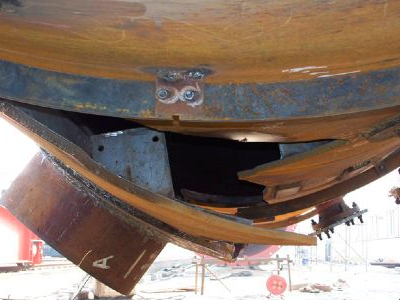 The easiest way to design for external pressure is to make the shell thick enough to make the vessel stable with an acceptable factor of safety (pass code calculations). The length of the vessel used in the calculations includes some of the head at each end. The calculations are found in ASME VIII-1 UG-28. The shell calculations are for a cylinder with supported ends (the heads at each end). Calculations are also given for the heads which are treated as spheres. The effective length of a vessel includes some of the length of the heads. The head is calculated as a sphere. (See the companion calculation set part 2 starting on page 4.) 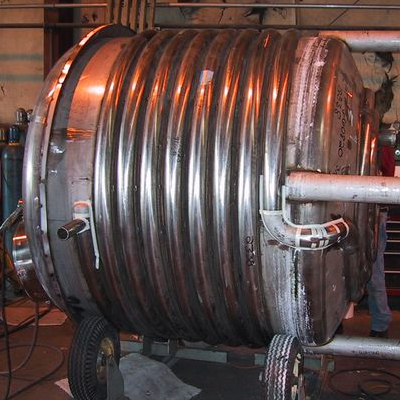 A typical vessel 48″ diameter with a straight shell 96″ long needs a shell 0.056″ thick for an internal pressure of 30 psi, but needs to be 0.225″ thick for a 15 psig external pressure (full vacuum) per VIII-1 UG-28. The F&D head on the left end needs to be 0.082″ thick for the interior pressure but 0.142″ for the vacuum. A SE head needs to be 0.046″ thick for the interior pressure but 0.127″ for the vacuum. The F&D and SE heads are both calculated as if they are part of a sphere, but the two heads are given different equivalent radiuses resulting in different required thicknesses. FEA results show that the shell will collapse at 4.04x the 15 psi applied pressure. This is greater than the 3x safety factor expected in the code and shows the code results to be acceptable. Instead of making the shell thick enough to handle the external pressure, an economical vessel can often be designed by reinforcing the shell. When the reinforcement is as strong as required by UG-29, the effective length of the shell is reduced and thinner shells can be used. In this case, L1 and L2 are calculated separately. Each zone independently passes the code calculations. The UG-29 reinforcing calculation ensures that the reinforcing is strong enough that whatever happens on one side of it has no impact on the other. (See companion calculations starting on page 9.) The sample vessel shell reduces in required thickness from 0.225 to 0.168″. Not bad for the addition of a 0.25 x 2.5″ bar rolled the hard way. More rings could be added to lower the required thickness further. The required head thickness could also be reduced by adding some type of reinforcement. VIII-1 allows for this, but provides no guidance on the design. 8.1x factor of safety with a thinner shell and a vacuum ring added. The code rules are excessively conservative in this case. Simple jackets made from rolling plate welded to the shell at both ends create zones of external pressure. If there is no internal vacuum then the length used for the external pressure calculation is the length of the jacket. (See companion calculations starting page 15.) If a 24″ long jacket at 30 psi is added to the outside of the straight shell, then the external pressure of 30 psi needs to be calculated for an effective length of 24″. The shell needs to be 0.160″ thick under the jacket per UG-28, but could be 0.063″ elsewhere for the 30 psi internal pressure (minimum code allowed thickness = 0.063″). The jacket rings are not functioning as vacuum support rings (action on one side of the ring is not isolated from the other side) but the factor of safety is acceptable at 4.3x. The jacket closure is not stiff enough to function as a vacuum ring – the jackets effects extend beyond the effective length of the jacket but the design is acceptable. 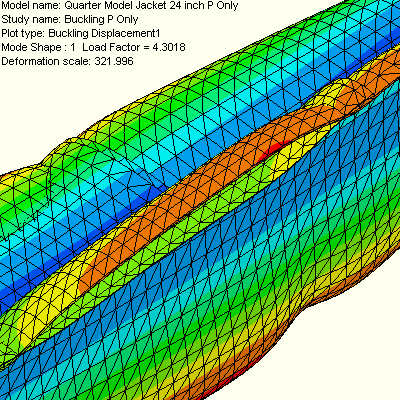 Finite element analysis results show that the effect of the external pressure is not confined to the length of the jacket. 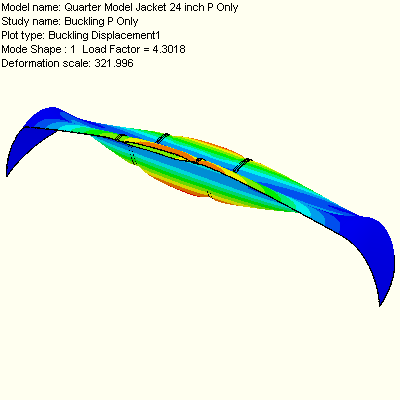 The jacket closure per App 9-5 is not as strong as required by UG-29 but the outer jacket shell adds to the stiffness of the shell. 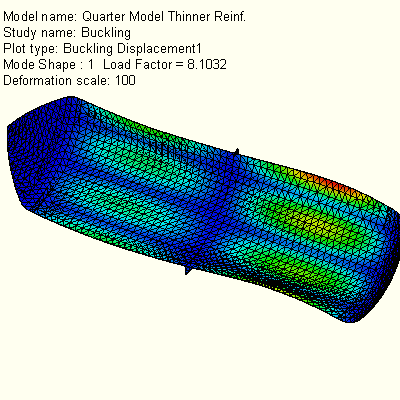 The FEA shows the factor of safety is adequate at 4.3x and experience indicates that this type of design is safe. Stronger end rings on the jacket can isolate the action inside the jacket area from the rest of the shell. This goes above and beyond the VIII-1 code requirement which does not require UG-29 on jackets. The jacket closure ring is stronger – it now meets UG-29 requirements. The effect of the pressure is now confined to the span of the jacket. The factor of safety is 5.8x (Acceptable). (See companion calculations starting page 17.) The jacket closure is now 1″ x 1.5″ and passes UG-29 rules for a vacuum ring. Action of the jacket has been isolated within the span of the jacket. The factor of safety is 5.8x. This level of safety goes beyond what the code and practical experience indicates is necessary. The simple jackets in the picture below do not connect – two separate zones of external pressure are calculated. As the zones get shorter, the required thickness to pass external pressure calculations is reduced. See Fig UG-28 for a definition of L that shows the treatment of the zones as separate lengths. A common mistake is to assume that the external pressure has to apply to the full vessel length or that the separate sections need to be treated as common. See UG-28. Multiple unconnected jackets lead to the case of half pipe jackets. The length of the external pressure has been reduced enough that it often has no impact on the design (but it still needs to be calculated). 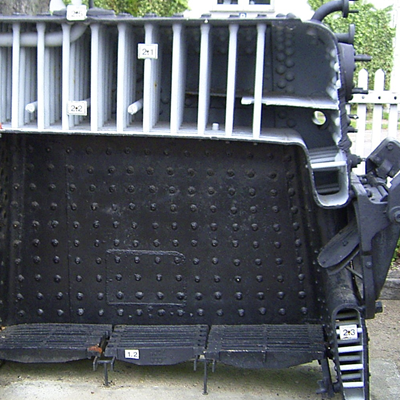 The code calculation could be based on the dimension L and the regular code calculations applied for the straight shell, but there are no code rules available for the half pipe on the head. Appendix EE contains rule EE-2(1) which provides a means of calculating the required shell thickness to handle the jacket pressure. This provides the same required thickness for the shell under the jacket regardless of the local shape of the vessel – it is the same for the head and the straight shell. (See companion calculations starting page 22.) If the shell is calculated using UG-28, then a thickness of only 0.095″ is required, however these results cannot be applied to the head. The appendix EE half pipe calculation requires a wall thickness of 0.188″ (the lowest value provided for on the charts) for a 3″ half pipe jacket pressurized up to 243 psi on shell or head. A common mistake with half pipe jackets is to assume that the vessel has to be designed for external pressure – this is only true if there is another source for external pressure other than the pressure in the half pipe jacket. The accepted method of calculating the required shell thickness is to use the rules of appendix EE-2. EE-2 is not mandatory so other methods such as UG-28, burst test and finite element analysis are also available to the designer. A common mistake with half pipe jackets is to assume that the full head of a vessel under the jacket needs to be calculated for external pressure. The EE-2 method is very useful because no code rules exist for a head that is only partly exposed to external pressure. 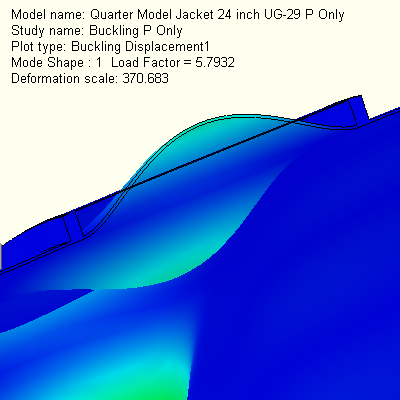 A common mistake with half pipe jackets is not to calculate the required vessel thickness under the jacket to EE-2(1) or other methods. Stayed surfaces provide freedom to the designer using jackets. No longer do we care about the shape of the object under the jacket, or the shape of the jacket itself. We do not care whether the shape has pressure on an internal (concave) or external (convex) shape. We do not care if the failure mechanism is the crushing type of collapse (external) or tearing (internal). What we care about is the distance between stay rods – are the stay rods strong enough, attached well enough, and are the shell and jacket surfaces thick enough to support the span between stays. The rules for stayed design are found in VIII-1 UG-47 and work the same way as the design of flat heads found in UG-34 but now we look at the distance between stays instead of the diameter of the head. Because the rules are designed for flat surfaces (the weakest shape found in pressure vessels) they will work for any shape of vessel or jacket. The distinction between what is the vessel and what is the jacket is often not important. (See companion calculations starting page 25.) If our vessel has a jacket supported by stays on a 6″ spacing, then the required head or cylindrical shell thickness is 0.164″. The stays have to be 0.4″ dia The rules for the dimple jacket are found in Appendix 17. The internal (pressure vessel wall) thickness is calculated per 17-5 (b)(1) or (2) – modified flat plate calculations that can be used for any shape of vessel. The jacket portion is tested by burst test and can be used for any shape of vessel. Note that laser welded and inflated jackets have special restrictions regarding the burst test (last portion of section 17-5(a)(2). This laser welded dimple jacket will be inflated once it is rolled into the shape of a shell and welded to the rest of the vessel. The inflation pressure can be as high as 800psi. This inflation pressure is higher than the required burst pressure and is far in excess of any allowed external pressure for the vessel. This only works because the pressure inside a dimple jacket is not an external pressure. The dimple jacket is a form of stayed jacket that can be any shape. 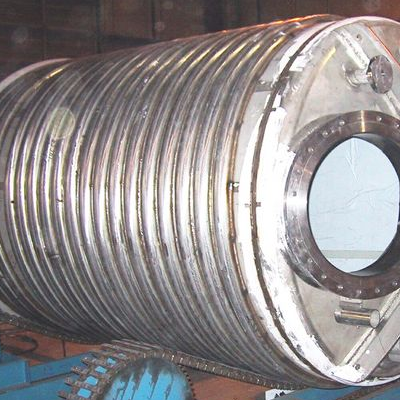 If our vessel has a dimple jacket with a 6″ spacing then the required head or cylindrical shell thickness is 0.140 inch. (Equation 17-5 (2), not included in the calculation set.) A common mistake with dimple jackets is to assume that the vessel has to be designed for external pressure – this is only true if there is another source for external pressure other than the pressure in the jacket. The accepted method to calculate the required shell thickness is to use the rules of 17-5. A common mistake with dimple jackets is to not calculate the required thickness of the head or shell but assuming that it will be adequate because it is thicker than the dimple jacket. A shell of inadequate thickness can lead to yielding under hydrotest showing the location of the dimple welds from inside the vessel (the inside surface is no longer smooth). The dimple jacket has some strength from its shape that the shell does not have. External pressure calculations are more difficult with more than one source of external pressure – a typical example is a vessel with an internal vacuum and pressure in a jacket. The cases with the stay rods, half pipe jackets and dimple jackets are the simplest – first calculate the complete vessel for the vacuum condition as if the jacket does not exist (see the first cases above). Next calculate the shell for the local loads under the dimple/pipe/stay using the combined P + Vacuum. Finally design the jacket for the pressure P.
Step 1: the external pressure is now 15+30 = 45 psi (vacuum +30 psi jacket pressure). The required thickness under the dimple jacket rises to 0.172″ (Formula App 17-5 (2)). The minimum stayed thickness is now 0.200″ (Page 29). The thickness under the half pipe jacket remains at 0.188″, the minimum thickness provided for in the appendix EE charts (Page 30). Step 2: the whole vessel has to be calculated under the 15 psi external pressure. This was calculated back at pages 5, 6 and 7 in the calculation set: The F&D head – 0.142″ thick, the SE head – 0.127″ thick, the straight shell 0.225″ thick. Step 3: the maximum thickness from step 1 and 2 above is used. The straight shell is limited by the 15 psi external pressure – it needs to be 0.225″ thick. The F&D and SE heads are limited by the half pipe jackets found on them and need to be 0.188″ thick. A common mistake is to attempt to calculate the entire vessel for an external pressure of P+V. The required thickness of the straight shell from the vacuum only load can be reduced by adding the vacuum stiffener as previously calculated. 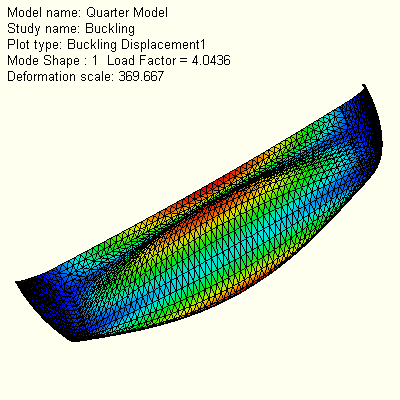 More stiffeners can be added until the shells required thickness from vacuum pressure is equal to that required by the dimple/pipe/stay calculations. The straight shell external pressure calculation with vacuum ring was calculated on page 10. The required thickness = 0.169″ less than required under the dimples, stays or half pipe jackets. Those required thicknesses now govern and the shell thickness cannot be further reduced by adding more vacuum rings. 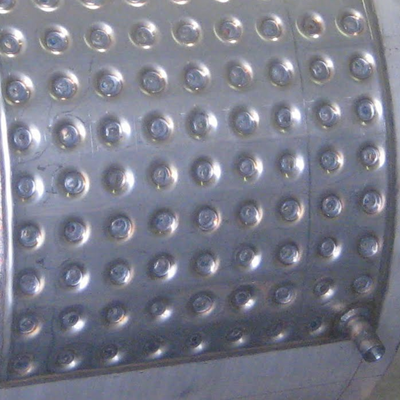 Question: When single embossed, jacketed assemblies, such as described in Appendix 14, are used as shells subjected to external pressure loading on the embossed side, may properties of the embossed assembly be considered when determining the required thickness of the flat plate for the external pressure? Reply: Yes. The geometry covered by your inquiry is not specifically covered by any of the rules of Division 1. However, the rules of U-2(g) shall apply. 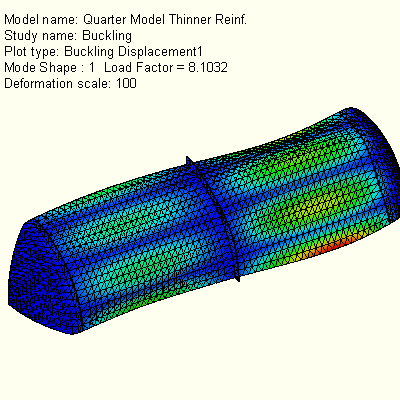 External pressure burst testing or finite element analysis could be used to determine a thinner safe vessel thickness than possible using standard code calculations. 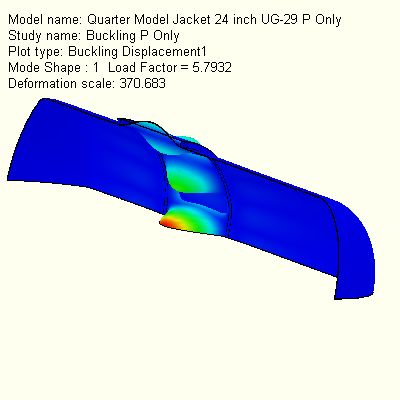 The burst test or FEA would include the stiffening effect of the jacket. The goal of a line of support is to effectively segment the vessel into sections that can bear the pressure load independent of adjacent components. What happens on one side of the line of support does not affect the other side. This can be seen in the UG-29 vacuum ring example back at the beginning of this article. One cone acts as two lines of support if each cone – shell junction passes the area replacement or special analysis rules of App 1-8. The area replacement rules work for cones with an angle up to 30 degrees. Special analysis is required over 30 degrees. If a cone is not checked against Appendix 1-8 the effective length will continue straight through the conical section. Each adjacent cylinder will be calculated using the full effective length, Le (see illustration). More commonly, each end of the cone is calculated as a line of support. App 1-8 provides the rules for area replacement. Special analysis is required for cone angles > 30 degrees. The cone and shell thickness both affect if the juncture passes. Alternately, stiffening rings like vacuum rings can increase the stiffness of the junction to meet code rules. (See page 31 of the companion calcs.) The left head, and straight shell sections are calculated the same way as before. The cone is calculated to pass external pressure on its own (page 34), and again as a juncture with the shells (page 36). 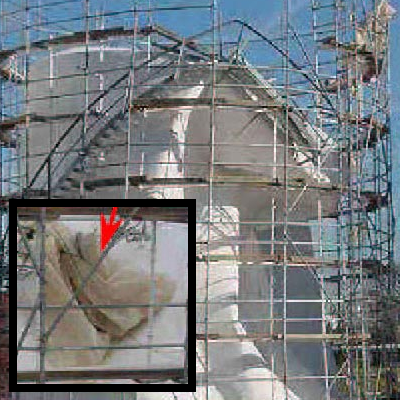 Because the angle of the cone is 45 degrees, a special analysis based on Boardman’s methods as presented by Bednar in “Pressure Vessel Design Handbook” is used. This meets the requirements of ASME 1-8 and the cone provides two lines of support. FEA analysis verifies that the method is acceptable (see page 40). At the beginning of this article, the failure mechanism for external pressure was given, but not an explanation of how the failure mechanism works. A stable system is one that is stronger than required. When the vessel is pushed on, it pushes back and returns to its original shape. As external pressure is added to the system, the vessel has less reserve strength left to push back. Eventually the vessel reaches a point where it has very little reserve strength. You push on the wall of the vessel and it cannot push back. At this point the vessel can change shape to a smaller volume configuration. The change is sudden and irreversible and if you watch the YouTube videos, very scary. Alternately, one can visualize a long pole mounted in the ground. When the pole is pushed on from the side, it bends. Once the load is removed, it bends back. A small weight can be placed on top of the pole. The pole stays centered until it is pushed, and returns back to center once the sideways force is removed. However, as the weight on the top of the pole is increased, the pole loses its ability to push back against the sideways force. At a critical weight, the pole has no additional strength, and a fly landing on top causes it to topple – without any sideways force. The failure is irreversible and sudden. The weight on top of the pole is similar to the external pressure on the outside of a pressure vessel. Because the exact calculation of the critical external pressure on a vessel is difficult, we set a 3x factor of safety, higher than many other safety factors in pressure vessels. 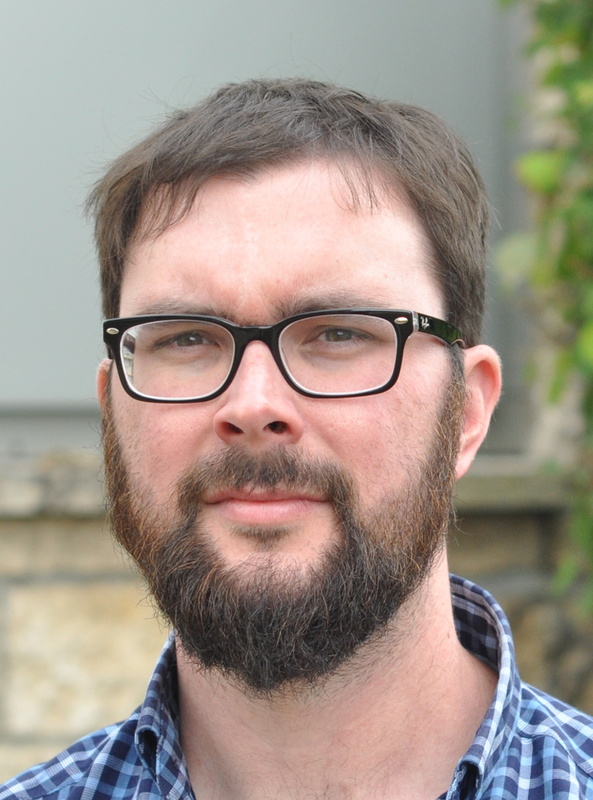 The code aims for a 3x factor of safety, sometimes calculating high, sometimes low. Less conservative approaches would require more exact calculations, such as provided by FEA, but at the cost of extra engineering effort. A cylinder imploding under internal vacuum, equivalent to external pressure. 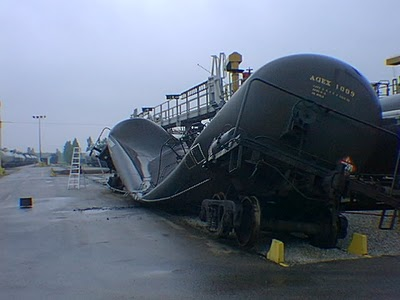 This iconic video shows vacuum collapse of a railway transport tanker. How to collapse a storage drum with the help of condensing steam. Condensing steam again used to create a vacuum. An extensive photographic library of shell buckling failures and mechanisms along with explanations of the failure mechanism. 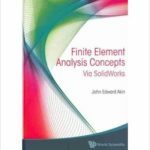 J. Ed Akin at Rice University, Houston, Texas has written a very readable book on using SolidWorks to do Finite Element Analysis (FEA) – “Finite Element Analysis Concepts Via SolidWorks”. Chapter 12 covers buckling analysis without getting lost in math. The approach used would be of interest even to people not doing FEA.